THE ABBEY'S LEGATE ELDER IS A MASTER ALCHEMIST AND BELIEVES NO MEANS IS TOO EXTREME FOR REALIZING THE GOOD OF ALL. STATS AND TECHNIQUES ON THIS PAGE WILL BE UPDATED AS WE GO ALONG. The Abbey’s Legate elder is a master alchemist and greatly learned in ancient knowledge. As an advisor to The Abbey’s supreme leader Artorius Collbrande, Melchior subscribes to an amoral view in exacting the purpose of the Exorcists. As such, he is willing to do even the most unthinkable at the expense of any and all. Strongly sharing ideals of Artorius, Melchior serves as The Abbey’s chief strategist in its campaign against all who oppose them. He seemingly despises the sorceress Magilou, despite their being on the same side. With a lack of sympathy for the consequences of the Exorcists’ actions, Melchior is determined to see their dreams realized at any cost. 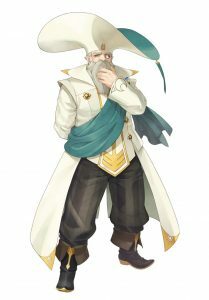 Melchior is a formidable magic-wielder and will pose a great challenge to Velvet and her party. In combat, he wields multiple orbs and can cast various elemental spells for devastating damage.